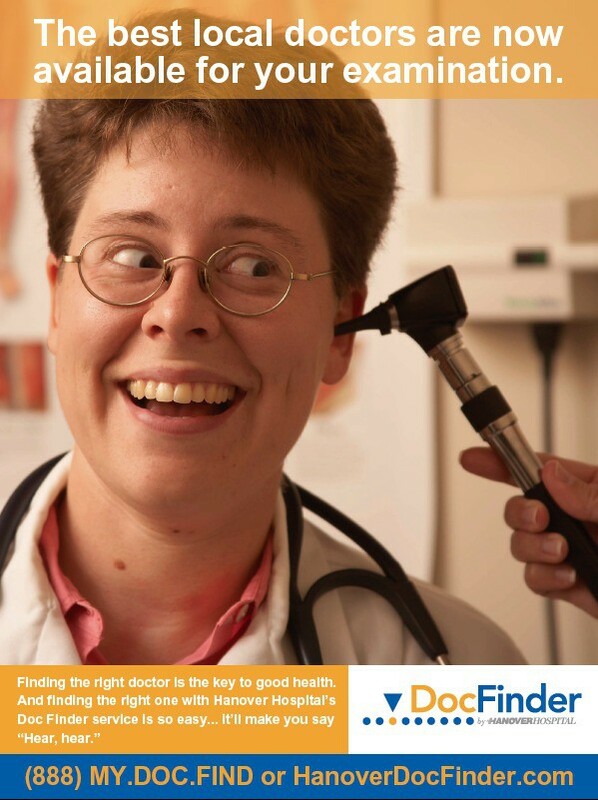 OBJECTIVE: Get people in Hanover, PA to use the hospital’s DocFinder service to closely examine their doctors—and go see one. SOLUTION: For this campaign, we used real doctors in the hospital’s network. We empowered the reader by showing a prospective patient examining a doctor (much like one would review a doctor’s credentials online). The DocFinder service was new, so fun posters made using the service seem simple. Also, by showing doctors having fun in this campaign, it helped put a friendly face on the service and hospital. EXECUTION: “Hear hear” introduces potential patients to a leading ear, nose, and throat doctor at the hospital in Hanover, PA.